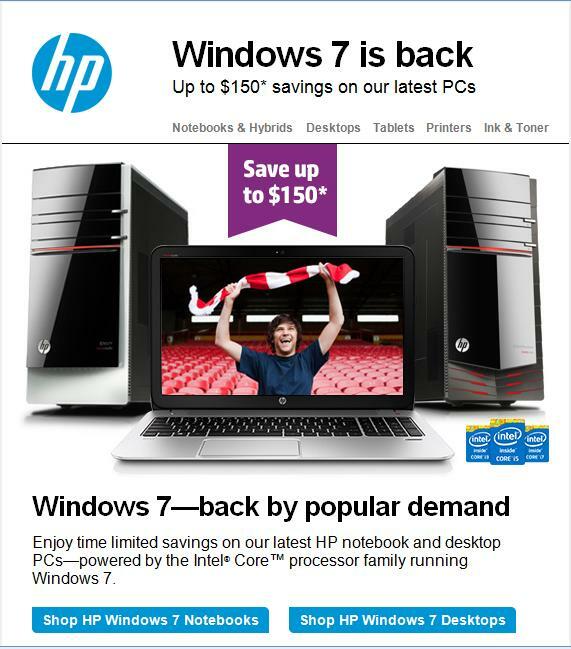 Gregg Keizer reports at Computerworld that Hewlett-Packard has stuck their finger in Microsoft's eye by launching a new promotion that discounts several consumer PCs by $150 when equipped with Windows 7, saying the four-year-old OS is "back by popular demand." "The reality is that there are a lot of people who still want Windows 7," says Bob O'Donnel. "This is a twist, though, and may appeal to those who said, 'I do want a new PC, but I thought I couldn't get Windows 7.'" The promotion reminded O'Donnell and others of the dark days of Windows Vista, when customers avoided Windows 7's predecessor and instead clamored for the older Windows XP on their new PCs. Then, customers who had heard mostly negative comments about Vista from friends, family and the media, decided they would rather work with the devil they knew rather than the new one they did not. "It's not a perfect comparison," says O'Donnell, of equating Windows 8 with Vista, "but the perception of Windows 8 is negative. I said early on that Windows 8 could clearly be Vista Version 2, and that seems to have happened." HP has decided that the popularity of Windows 7 is its best chance of encouraging more people to buy new computers in a declining market and is not the first time that HP has spoken out against Microsoft. "Look at the business model difference between Intel and ARM. Look at the operating systems. In today's world, other than Microsoft there's no one else who charges for an operating system," said HP executive Sridhar Solur in December, adding that that the next generation of computers could very well not be dominated by Microsoft. [hr][sup]1[/sup] "HP sticks thumb in Microsoft's eye, discounts consumer Windows 7 PCs" -- Gregg Keizer, Computerworld. [sup]2[/sup] "HP brings Windows 7 back 'due to popular demand' as buyers shun Windows 8" -- Chris Merriman, The Inquirer.